The American Idol Experience was a theme park attraction at Disney's Hollywood Studios at the Walt Disney World Resort. Inspired by the popular American television series American Idol, the attraction invited park guests to audition in front of live audiences who would vote for their favorite singers. The attraction was announced on February 7, 2008, although specifics were not made public at that time. American Idol season six winner Jordin Sparks unveiled its official name and projected opening date during the American Idol season seven finale on May 21, 2008. Disney licensed the show's logos and set design from American Idol's production companies, 19 Entertainment and FremantleMedia. The attraction is located in the "Superstar Television Theater" (formerly the "ABC TV Theater"), which originally was home to Superstar Television, one of the first attractions to open at the park in 1989. The show took place of Doug Live!, which ran from 1999 to 2001. The attraction's grand opening took place on February 14, 2009, with occasional preview performances in the weeks leading up to the official opening. A press event just prior to the official opening featured many "Idol" celebrities, including all seven winners, numerous finalists, host Ryan Seacrest, judge Paula Abdul and "American Idol" creator Simon Fuller. 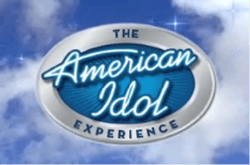 The American Idol Experience has been promoted by winners of the American Idol from Season seven onwards by appearing in commercials and announcing "I'm going to Disney World!". In June 2014, Disney announced that the show would close in January 2015, then two months later they moved up the closure date to the end of August 2014. The show's final performances were on August 30, 2014. Park guests age 14 and older auditioned before a Disney "casting director" who judged singers based on their ability to sing and perform in front of an audience. As with the auditions for the television show, initial auditions are a cappella. Selected singers advanced to a second round for an audition with a "producer", where they select from a song list (see photo right) provided by the producers which included pop, country, rock, Latin, R&B as well as Disney songs and then audition again, this time with pre-recorded music; to ensure that guests hear a wider variety of songs, singers could only select songs that have not previously been chosen that day. Those who pass the second audition would be scheduled into one of the preliminary shows each operating day. Guests could only enter the competition twice in a seven-day period and if they win the dream ticket not again for a year. The attraction featured usually five shows each day. Three guests perform in these shows. The five guests who won each show go on to the final. At each preliminary show, guests performed before a live audience inside the attraction's main theater, designed to resemble the television show's stage. Each act also got a separate introduction based on what you might see on the television show. For example, the second guest had a small video dedicated to them and the third guest participated in a small interview. Using electronic keypads at their seats, the audience voted for their favorite singer, who would return for the final show of the day. Finale show and "Dream Ticket"
The last show of each operating day featured the winners of that day's preliminary shows. Again, the live audience voted for the performer they liked the best. During the show, the audience was prompted to encourage the contestants and heckle the judges. Each day's final winner receives a "Dream Ticket" that will allow him or her to bypass the queue at one of the regional American Idol auditions for the television show, provided he or she meets the show's age and residency requirements. If the winner is not eligible, he or she will be allowed a "one-time" transfer of the "Dream Ticket" to another person, or can save the ticket until the age limit is met. Each day there were three judges. They have credible backgrounds in the music industry usually having performed on Broadway, West End or similar. The last judge most frequently gave negative feedback, but had been known to make kind comments for exceptionally strong performances. As of May 2010, one "Dream Ticket" winner, Aaron Kelly, had advanced to the American Idol finals. Kelly finished fifth in the 2010 season. Another winner was Nolan Sotillo, who sang " What Hurts The Most " by Rascal Flatts. Sotillo is notable for starring in Disney's Prom. A previous "Dream Ticket" Winner from South Africa Mark Haze was runner-up in the seventh season of Idols South Africa. Scottish singer Jai McDowall got through the audition stage whilst on holiday in 2009, he later reached the bootcamp stage of the 2010 The X Factor UK and then won the 2011 Britain's Got Talent winning a contract to Simon Cowell's Syco label. Thirteenth season finalists Majesty Rose, Ben Briley and Emily Piriz all won Dream Tickets at the attraction. Fourteenth season semi-finalist Adam Ezegelian was a two-time Dream Ticket winner (2009 and 2014). ↑ Stacey, Russ. "Summer is the Best Time to Stay 'Frozen' at Disney's Hollywood Studios". disneyparks.disney.go.com. Disney Parks. Retrieved 9 November 2015. ↑ Dewayne Bevil (February 13, 2009). "Recapping the premiere of American Idol Experience at Disney World". Orlando Sentinel. Retrieved February 15, 2009. ↑ Kris Allen is... "Going to Disney World!". May 21, 2009 – via YouTube. ↑ "'American Idol' Champion Lee DeWyze 'Going to Disney World' on Monday". Disney Parks Blog. ↑ Bevil, Dewayne (June 16, 2014). "Hollywood Studios: American Idol Experience closing". Orlando Sentinel. Retrieved June 18, 2014. ↑ Dewayne Bevil (August 15, 2014). "Closing time: Disney moves up end date for American Idol Experience". orlandosentinel.com. Tribune Newspapers. Retrieved August 15, 2014. ↑ Travis Reed, AP. "Become an American Idol, Ride the Mantas and More at New Theme Park Attractions". Travel, MSN. Archived from the original on May 28, 2009. Retrieved May 24, 2009.